I’m a meatatarian by nature and nurture, and sausage is by far one of my favorites. These veggie patties come extremely close to matching the real thing. If meat grew on a tree this is how it would taste. I was amazed at how good these were. I love meat, and I love spicy, but there’s something about these that make them surprisingly and undeniably good. The burritos definitely have more of a kick than expected, too. One of my wife’s favorites, and it’s up there for me too. The masala sauce is intoxicating, and it ties together a very good, somewhat off the beaten track microwave lunch. This stuff seems straight from another time from another part of the world. It’s thick and chunky and extremely filling. This ain’t no canned soup. We make a beeline for it when shopping. Pitas and hummus make a classic vegetarian pairing, and this combo should not be missed. Apocryphal Pita Nutrition info HERE. Garlic Hummus Nutrition Info HERE . Finally, a breakfast cereal worth waking up for. It actually puts a smile on my face early in the morning and keeps me full until lunch. The Mango Passion Granola truly has my respect. Quick ‘n easy potatoes, onions and eggs, and shockingly good out of a microwave. Tough to beat for a hot meal on a busy morning without a drive-thru involved. A tasty twist on a cereal classic. The maple and brown sugar flavor make for an easy morning for the taste buds and the biscuits are crispy crunchy to the last spoonful. Quick and portable for a quick grab. They could be a little bigger, especially if you wake with the hunger of a bear coming out of hibernation, but for what they are, they’re pretty darn good. Some mornings only oatmeal will do. Sorry Wilfred Brimley, this stuff is tough to beat. Ridiculously easy. Ridiculously satisfying. And ridiculously good paired with some TJ’s hummus. They’re spicy, homey, and have instant comfort. They’re restaurant quality for a fraction of the cost. The stix are good enough to rival spring rolls at many Thai restaurants. For being a one-trick pony, Thai Joe did pretty well for himself here. Not a lot of Parmesan, but good pastry, and thankfully, no pups involved. A good twist on the classic pig in a blanket, especially since the mini-dogs are beef. More delishy than fishy. These certainly make a decent seafood snack, and would be sure to please a crowd. A little plain, and not for those who are weirded out by miniature foods. Still, a pretty good facsimile, however smaller, of a pretty decent taco. 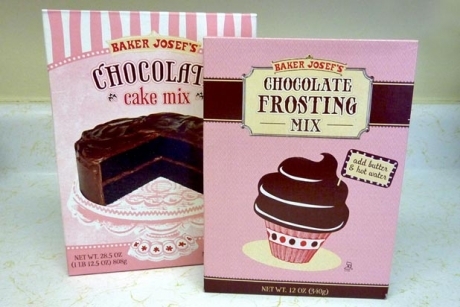 Nathan and Sonia’s biggest pleasant surprise was the Baker Josef's Chocolate Cake and Frosting Mixes. Neither one of them is really a "chocolate cake person," but they might be if all chocolate cakes tasted like this one. Okay, it’s not highly rated, but it was definitely one of the biggest pleasant surprises for me. It looked disgusting and I had to swallow hard before trying it, but the green beverage actually turned out to be fairly good overall. I definitely thought I’d score it much lower. After the very unsuccessful Organic Mango Nectar, we were a little hesitant to try this one, but it's really tasty. A bit oddly inspired, to be sure. Frozen microwavable tamales that actually taste good? That’s possible? In a word, yes. One of the most uniquely delicious tasting juices we’ve ever tried. It’s so good, it doesn’t taste healthy. Call me skinny, but choose to agree or disagree in the comment field below.